Earn $9.79 in Rewards credit (979 points) What's This? Most of the time, you read "compression" and comprehend "uncomfortable", and that's what De Soto set out to change with their Mobius Tri Short. Featuring their Mobius Comfort Compression fabric, this short offers performance-enhancing compression without excessive tightness. Inside, their minimalist seamless 1-piece chamois offers optimal comfort on the bike, while disappearing for the run or swim. 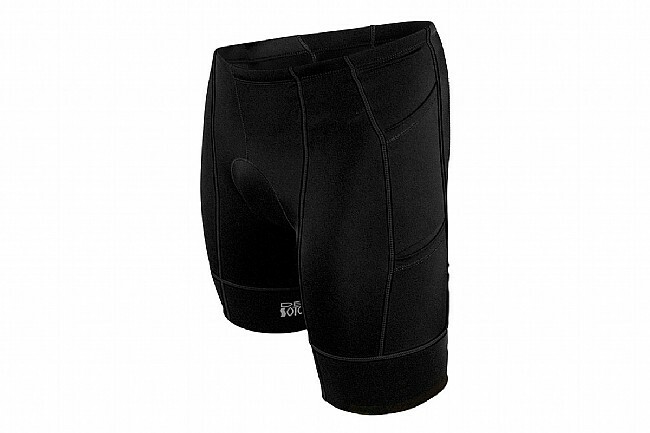 Outside, 4 pockets provide ample storage for your race or training session. 8-panel construction offers a supportive, compressive fit. Mobius Comfort Compression fabric offers effective, comfortable compression, not excessive tightness. 3" Mobius Comfort leg-bands keep shorts in place without squeezing. 4 pockets: 2 on each leg (1 front, 1 rear). Seamless 1-piece 4-way stretch minimalist fleece chamois provides comfort on bike, but goes unnoticed on the run. Elastic waistband with drawcord offers secure adjustability. Microlock™ stitching improves durability while reducing chafing. Not recommended for repeated use in a chlorinated pool.